Just a 3 minute walk to Woolacombe Beach this fabulous 3 bedroom Woolacombe Apartment sleeps 6 and has stunning sea views from almost everywhere you look. 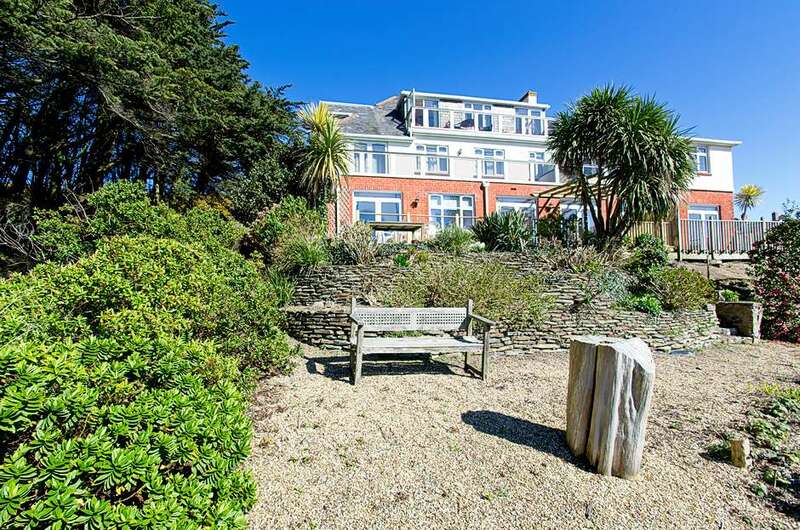 A sunny south facing decked terrace with table and chairs and lounger chairs has steps down to its own delightful garden area with bench to sit and enjoy the views to the sea, beach and hills over Woolacombe dunes. This seaside apartment has been in the same family for years and has recently been lovingly upgraded and refurbished ready to holiday let. The entrance hall leads to the first and smallest bedroom with single bed, chest of drawers and bedside cupboard. The window is to the back. The hallway then leads on to the large bright living/dining room with drift wood mantle and gas flame effect wood burner and large L shaped corner sofa in blue and white coastal stripes. The two arches open into the dining area and patio doors to the decking. A dining table with 6 smart grey directors’ chairs and slate table mats sits next to large windows looking out to the bay. There is a large flat screen TV and Wi-Fi. The decked area stretches across the front of the apartment and then there are steps leading to a delightful private area with a bench to sit and take in the super views. The outdoor taps is useful for rinsing off wetsuits and sand after a day at the beach. A good size kitchen has under worktop fridge and freezer, full size dishwasher, double sink, microwave, oven and hob and a walk in larder with washing machine and shelves for food storage. The second double bedroom has a window to the sea and has a double and single bed and wardrobe. Along from this is the master double with striking double bed with headboard and coordinating finishing touches as in all rooms, the décor has been tastefully thought out. This bedroom has a dressing area with two wicker chairs positioned to take in the view and has patio doors to the decking. It also has an en-suite shower room with WC, basin and shower. The family bathroom has a bath with shower over, WC and wash basin and heated towel rail. A £100 security deposit is held and released after the holiday. 2 parking spaces. Please note that currently some building work is being undertaken at the rear of The Narracott hotel and there is a crane within the view from the property. All on one floor this apartment makes such a great place to spend a beachside holiday with everything on hand and within a few minutes walk, there really is no need to use the car. I think this place literally ticks every box!